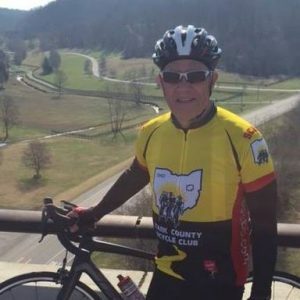 With dogged determination, Don Eagon, an avid cyclist and cancer survivor, persevered along many difficult roads on his health journey. Don grew up in the blue collar neighborhoods of the Massillon steel mills where he quickly learned to fend for himself by “outsmarting the tough guys”. He worked to put himself through Canton Central Catholic where he excelled in football, wrestling, track and field, and baseball. He then worked and saved enough money to graduate from Walsh University, and he completed graduate work at Kent State University while coaching and teaching at Glenwood High School. Don notes, “I taught myself that if you want anything in this world you have to have the ‘intestinal fortitude’ and drive to go get it. No one is going to give you a free handout. In my case, two cancer surgeries and rehab gave me the opportunity to test that theory”. While working long hours with a goal of early retirement, Don says that he lost sight of his health goals and had to consciously re-focus and set new goals to “eat better, work smarter, and to regiment myself to a smart cardio exercise program” which included his love of cycling. In 1988 when genetic cardiac problems threatened to interfere with achieving his goals, he sought out a physician and trainer who worked to put together a program for Don that included exercise and medication. In the spring of 2013 at the age of 71 Don learned that he had renal and lung cancer. Of his diagnosis, Don says, “This pushed me to my limits of preparing for the two back to back surgeries. I was healthy, in outstanding condition and mentally ready. Following the surgeries, the third element missing was help and I knew a trainer was needed”. Don found Sonia and Get 2 the Core Fitness online. Don, his son, and his daughter compared and interviewed other trainers before deciding that Sonia’s expertise and training enabled her to understand what was needed in his situation following surgery. Less than a year after his diagnosis and treatment, Don was back on his bike and racing. Along his journey, Don has faced tremendous challenges and triumphed. Don notes that he had to “rebuild my body in ways I had not experienced before. Plus, I was 71 years old, which presented even more challenges”. However, Don’s mindset is clear regarding challenge, for he says, “I have always been the one to love challenges because to me they are opportunities. Never tell me ‘impossible’ because my goal will be to prove you wrong”.